This is a heart-warming story written by Bishop "Ambo" David. 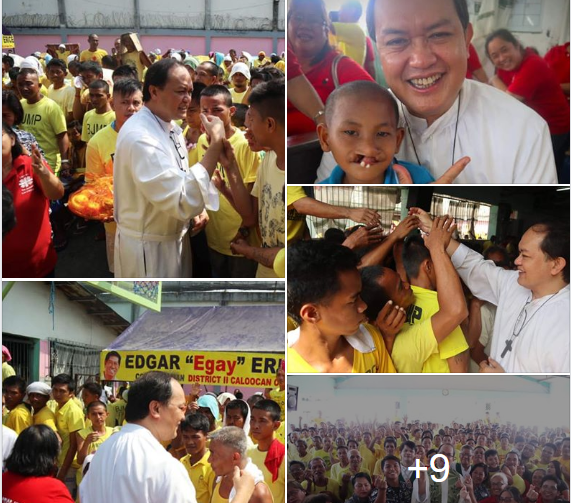 I know him personally -- cool, warm and very friendly priest, now a Bishop. He is the younger brother of my former boss for 3 years, Prof. Randy David during 'Public Forum' days in IBC Ch 13 in the 90s. When I went to the Netherlands for 3+ months in 1987, I was also able to see him in his graduate school, University of Louvaine I think, in Belgium. MORE THAN 2,500 PRISONERS IN A JAIL WITH A MAXIMUM CAPACITY OF 200! The heads that I laid hands on were greasy. The hand-clasps that I got were tight, like they wanted to hold on, desperate for a little blessing. One of them proudly presented to me his son, a little hare-lipped boy who smiled from ear to ear despite his severely deformed mouth and teeth. Before I stepped out of their quarters, they asked for a group photo with me. I suggested a wacky pose, signaling a little heart sign with the thumb and the forefinger pressed on each other. They imitated my wacky pose and, after the group photo, warmly waved goodbye to me. * This is my column in BusinessWorld yesterday, October 30, 2018. The Duterte government is known for political environmentalism and recycling — it recycles its heavily tainted officials, sacking them from one post only to be given another post in another government agency. The Bureau of Customs in particular is becoming more known as a “blinded” facilitator of multibillion pesos worth of imported shabu smuggled into the country. The World Economic Forum (WEF) publishes an annual report, the Global Competitiveness Index (GCI) and GCI 2018 was released two weeks ago. 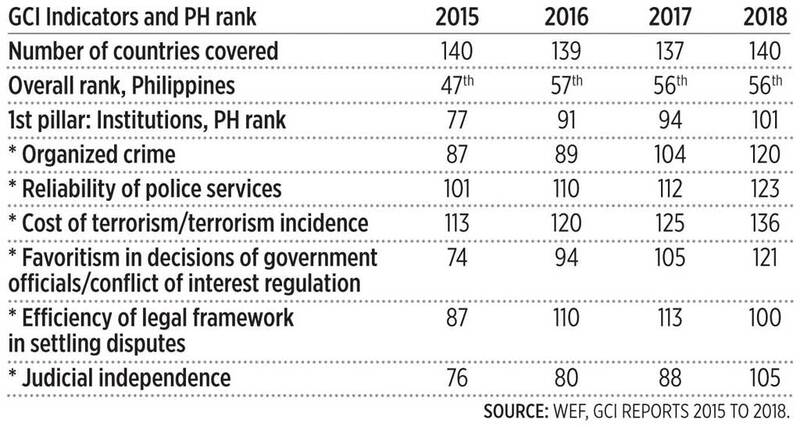 The good news is that the overall rank of the Philippines has stabilized at 56th-57th the past three years. The bad news is that the country’s rank in Pillar #1, reliability of institutions, obviously the most important out of 12 pillars and components, has been declining and eroding. There is overall decline of the rule of law, decline of reliability of the police and judicial independence, and increase of organized crimes and terrorism over the past four years. I skip the 11 other pillars and focus on some components of pillar #1. 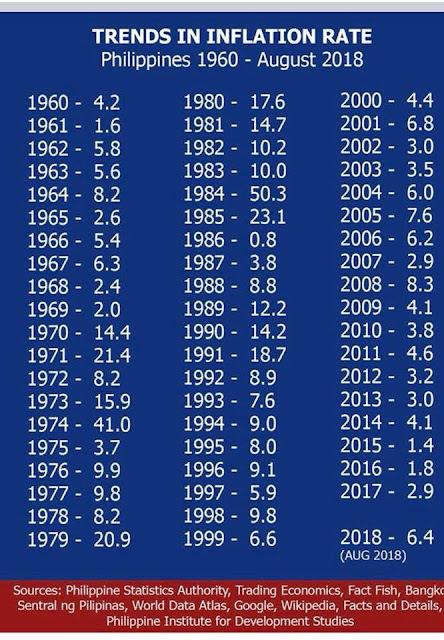 The trend can be depressing (see table). Where investors are less secure about their own safety and their businesses, we can expect a flatline if not decline in business optimism, which is countered somehow by the Philippines’ most important advantage now — a big and young population, meaning more workers and entrepreneurs, more producers and consumers. Meanwhile, a garbled competition policy by the Philippine Competition Commission (PCC) penalizing both Uber and Grab for their merger last April will be another uncertainty factor that potential big foreign players will note if they ever think of coming in. Among the most important factors for real competition to kick in is the existence of a “contestable market,” which is zero or minimal cost of entry and exit. New players entering a sector anytime so long as they have sufficient resources, then exiting it when the projected revenues and profit do not materialize and before they lose more money. The exit of Uber in the Philippines and other ASEAN countries was a global headquarter decision, not country manager’s decision. When Grab became the surviving entity, it inherited the expectations and combined demand level (about 600,000 bookings a day) but not the combined supply of transport network company (TNC) cars and drivers because LTFRB has not acted on the franchise application of 8,000 cars out of total 19,000 Uber cars before the merger. So while demand remains the same but supply has declined, the supply curve shifts to the left, the immediate results are (a) longer waiting time for passengers, and (b) higher fares via higher surge pricing as a form of price rationing. Those who are unhappy with the higher price will seek the regular taxi or aircon vans/UV express, P2P buses, regular buses, and so on. Thus, PCC’s penalty of P16 million vs Grab and Uber is wrong. The decline in supply of TNC cars, the longer waiting time by passengers, was caused by LTFRB, not by the merger. Penalizing players for a problem caused by another government bureaucracy is a policy signal to potential big players and competitors that the same level of penalties and harassment can be applied to them someday once they come here. There is high entry cost, high exit cost, far out from being a contestable market. Bad business signal. Another garbled transportation policy is the heavy fare control of buses, jeepneys, taxi and UV express imposed by the LTFRB by granting a small fare hike purportedly to “protect the public.” When the operating costs (high oil taxes and prices, etc.) keep rising but the revenues per passenger do not catch up, public transportation companies will either (a) jampack their buses and jeepneys with more passengers, and (b) cut costs somewhere like extending the use of near-bald tires, using cheaper but less reliable spare parts. Either way, passenger convenience and safety is compromised, which defeats the LTFRB’s purported goal. Government must focus on the rule of law, not rule of incumbent politicians and bureaucracies. More competition favors the consumers and passengers. More regulations and prohibitions only favor bureaucrats and their corrupt ways. 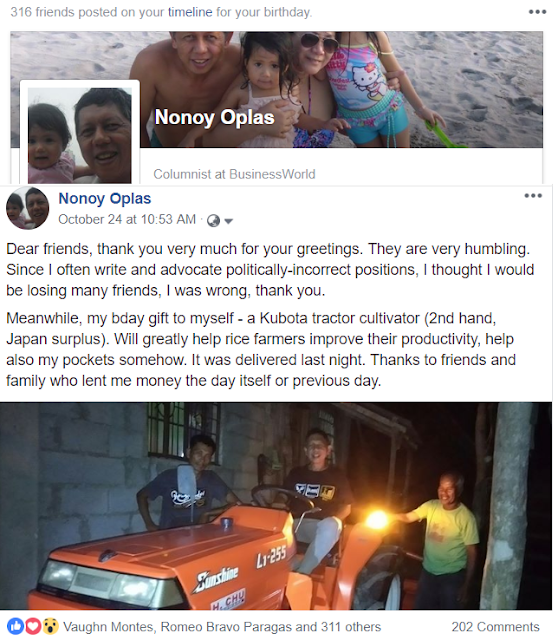 Last week, I have a brief and friendly debate in fb with a friend Rodney, who suggested that all mining activities in the Philippines should be closed because of the various environmental damage they cause. I countered that he should also give that advice to Australia, Canada, USA, Russia, Indonesia, Sweden, UK, Chile, etc. They are among the biggest mining exporters in the planet. Rod cited two cases: recent landslide in Cebu where many workers died, and the Placer Dome or Marcopper mining disaster in Marinduque many years ago. Itogon-Benguet, Cebu landslides, other past landslides were caused by so-called "small-scale" mining and quarrying, not by big corporate mining which are under strict monitoring by DENR, LGUs. Mining in the US, Canada, Australia, etc are all done by corporate players, no, zero, nada ‘small scale’ mining. The Marcopper mining disaster indeed was bad, it happened more than two decades ago and Marcopper paid a heavy price for that both in money and corporate brand/image. But if people cite a failed corporate miner, they must also consider non-failing corporate miners, lots of them. No landslides, no death, no dirty tailmines. There is also a tendency for people who live and work far away from successful and responsible mining towns and provinces, to just advocate total mining ban. They care little about lost jobs, lost community projects like free but private hospitals and schools, lost local and national taxes. They have their own jobs anyway. 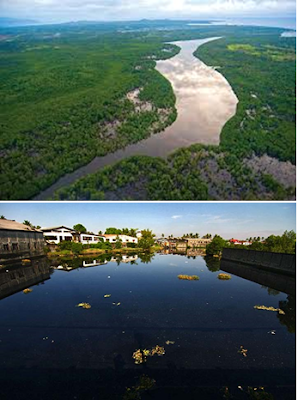 Pictures, top is Rio Tuba River in Bataraza, Palawan (with mining); below is Marilao, Bulacan River, (no mining). I have seen Barangay Rio Tuba mining, I went there about four years ago. One can go swimming, fishing, it's clean. The "blighted conditions of many communities affected by mining" is imaginary and emotionalism, hyped up by Gina Lopez and other dramatists. Mining in rio tuba is about 40, or 60 years already. One can see the place's population explosion, not implosion or reduction. People with stable jobs and free/cheap community projects tend to live longer, healthier, they expand faster. On forests and deforestation, a mining company which have say 20,000 has. only mines about 100 hectares at anytime. The rest are for structures like housing, hospitals, roads; then future mining areas; then mined out that have been reforested. That is why various government (Congress, DENR, LGUs) measures to further regulate, further tax, further bureaucratize corporate mining are counter-productive. 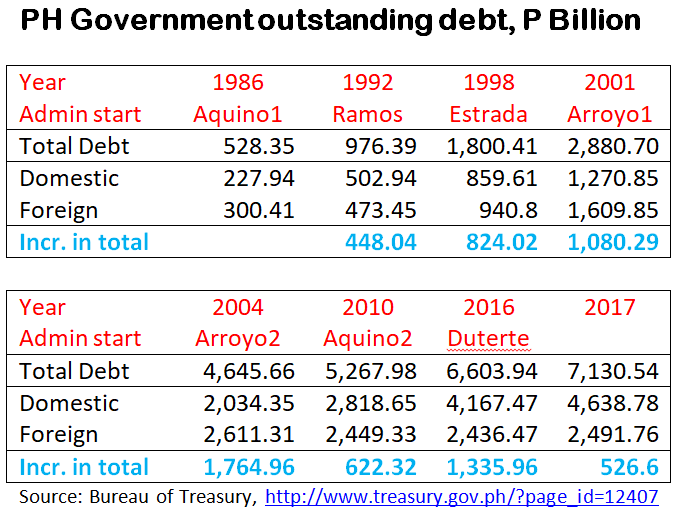 Growth of PH public debt stock, various administrations contributed: Cory Aquino P448B, Fidel Ramos P824B, Erap Estrada P1,080B, Gloria Arroyo1 P1,765B, Gloria Arroyo2 P622B, Benigno Aquino P1,336B, Duterte year1 P527B. If this trend continues, Duterte 6 years will add P3,162B. 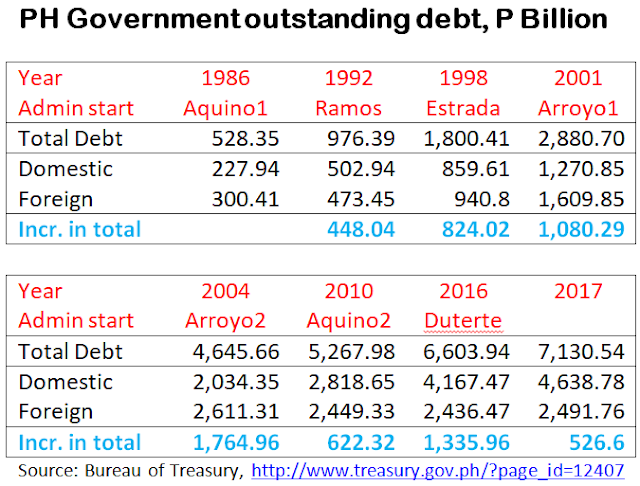 Now there is a post by Brondial shared 3,800+ by the DDS camp, implying that public debt started only during the Gloria Arroyo administration and B. Aquino admin added P4 trillion while Duterte year 1 added only P0.7 trillion to the PH outstanding public debt. Bogo. And yet many people gladly share the disinformation and stupidity. * This is my article in BusinessWorld last October 25, 2018. Yesterday, a lecture on “Capitalism and inclusion under weak institutions” was delivered by national scientist Dr. Raul Fabella, my former professor at UP School of Economics and fellow columnist here in BusinessWorld. Another columnist Romy Bernardo mentioned the lecture in his column here last Monday. Dr. Fabella talked about the primacy of fighting poverty and not inequality per se, the unwarranted expansion of state and politicians’ powers and regulations to sectors and services that are beyond their competence, the resulting government failure as government intervenes more and more supposedly to correct a perceived market failure, the consolidation of capital and investments into conglomerates that can somehow check the government’s over-arching interventionism, both local and national. When applied to an ongoing legislative dispute between existing distribution utility (DU), Panay Electric Company, Inc. (PECO) serving Iloilo City, and newcomer MORE Electric and Power Corp. (MORE Power), the issue of “weak but over-arching institutions” of government comes to fore. The PECO franchise bill at the House of Representatives was filed in Congress in July 2017 and after two hearings in November that year, end of story. MORE Power franchise bill on the other hand was filed only in August 2018 and was passed on third reading in just one month, faster than even Malacañang’s priority bills. I asked some friends living in Iloilo City, two of whom are faculty members of UP Visayas, how their experience is with PECO, if bad or good in terms of pricing and power supply stability. Good points – why the franchise and permit to operate electricity DUs and cooperatives are centralized in Congress and not decentralized in provinces and cities where the DUs operate? Because of the Constitution. A related point, why financially-muscular MORE Power would go for legislation and take over an entire franchise area – which is very politically controversial and generator of business uncertainty – when they can compete with PECO and all other DUs and electric cooperatives nationwide via the retail competition and open access (RCOA) provision of the EPIRA law of 2001? 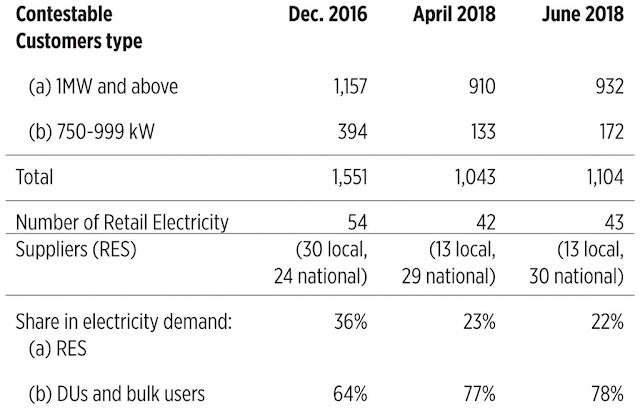 Becoming a retail electricity supplier (RES) to serve the “contestable customers” (CCs) or those that consume 750 kW or more is not politically controversial, will not require a Congress franchise, only an ERC accreditation, and one can go national and compete with several other RES. Below are some numbers on the implementation status of retail competition. It is a good guide for those contemplating to enter the Philippines’ electricity supply and distribution sub-sector. Minus the Supreme Court TRO on RCOA implementation around February 2017, the number of CCS and RES players should be expanding fast by now. 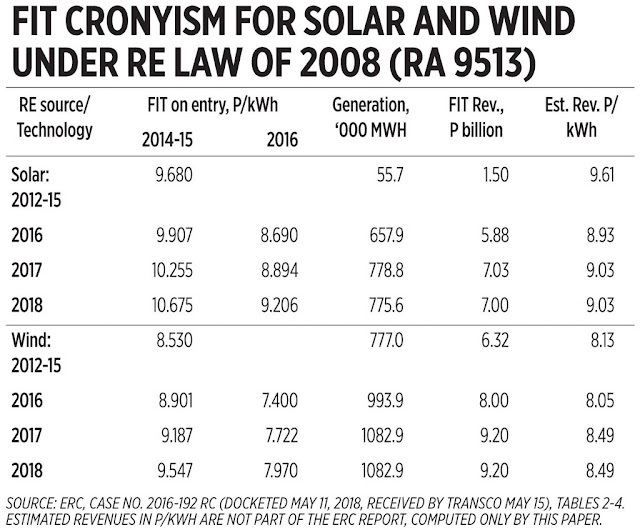 By going through legislative assault where Congress sat and did not act on the franchise renewal of PECO while its own franchise bill was approved in legislative lightning speed, MORE Power has put itself in the eye of public criticism of legislative favoritism if not cronyism. Perhaps this is a lesson that the power of the legislature to create franchises should be removed in the Constitution. Like power generation, power distribution should be deregulated and non-franchised. Capitalism in electricity distribution must get accreditation only from DoE and ERC which assess players based on technical grounds, not on political and cronyism factors. Climate Tricks 74, People should eat insects to fight CC? The climate alarmism movement is getting more ridiculous. 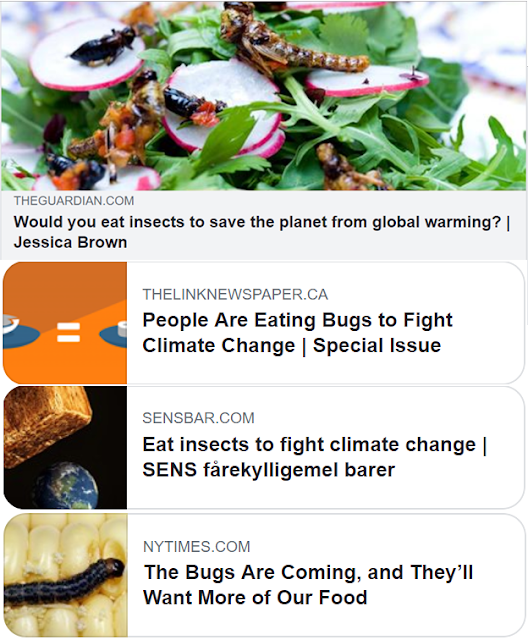 Advising people to reduce their meat intake and eat insects more, like crickets, worms, and perhaps genetically-modified 'edible' cockroaches? Agh. See these stories. Reducing our meat intake is crucial to avoiding climate breakdown, since food production accounts for about a quarter of all human-related greenhouse gas emissions, and is predicted to rise. In western countries, this means eating 90% less beef and five times as many beans and pulses. Edible insects have been hailed as a solution to both global food shortages and reducing emissions from animal agriculture, but despite the industry’s best efforts, our response when faced with a cockroach is disgust. If we compare, for example, crickets to cattle and chicken in terms of farming efficiency, it becomes apparent that they are the superior choice. To produce the same amount of protein crickets need 12x less feed than cattle, and half as much as chickens. Crickets also only need 15l of water compared to the 30 000l of water that cattle need and 2300l that chickens need. Crickets will require only 15m2 of farm land compared to the 250m2 for cattle and 45m2 for chickens. The team, which includes scientists involved in the N8 Research Partnership’s AgriFood programme, says halving global consumption of animal products by eating more insects or imitation meat would free up 1680 million hectares of land – 70 times the size of the UK. That's from the Univ. of Edinburgh, UK. agh. The Guardian again, they announced last week that they will limit or discontinue their climate blogging. ???? Two weeks ago, I traveled from Manila to North Luzon by bus. Going up via NLEx, SCTEx, Tarlac, Pangasinan, La Union, Ilocos Sur, Ilocos Norte, finally to Gonzaga, Cagayan. 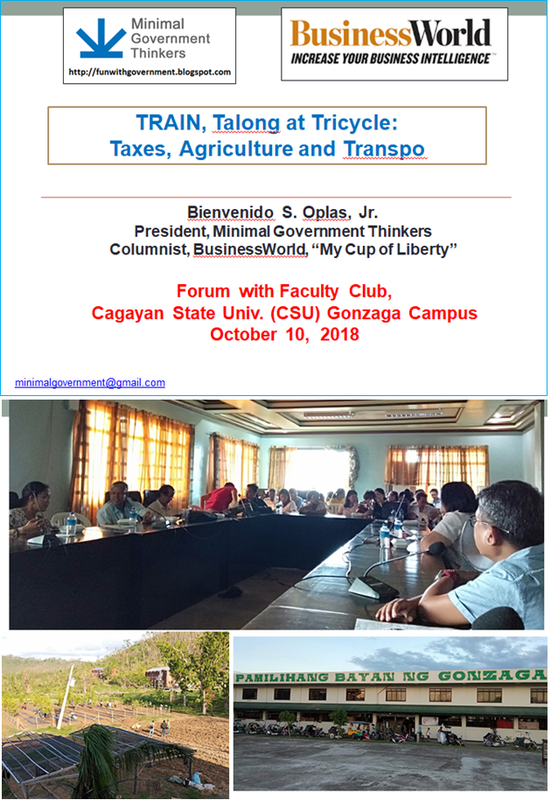 I went there to visit a friend, also gave a talk on TRAIN law and inflation at Cagayan State University (CSU) Gonzaga campus. Going back I took the Cagayan Valley route, passed Isabela, Nueva Vizcaya, Nueva Ecija, SCTEx, NLEx. 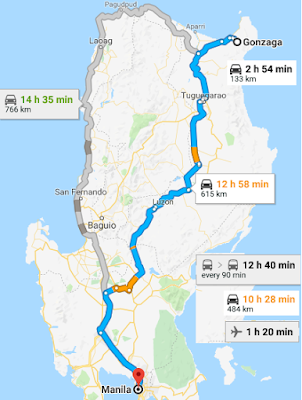 Among my observations in that nearly 1,500 kilometers trip are (1) too many motorcycles and tricycles now in the highway except tollways, and (2) lots of palay or corn are still dried on the highway especially in Cagayan-Isabela, these slow down overall speed of regular vehicles and may cause accidents. There is a need for more tollways around North Luzon and by extension, down to South Luzon, big provinces in Visayas and Mindanao. The subject of private tollways and Public Private Partnership (PPP) was discussed in a roundtable forum on “Unsolicited PPP Proposals” jointly organized by the Stratbase-ADRi and the PPP Center last Oct. 15, 2018. Among the speakers and reactors were Mr. Ferdinand Pecson, current Executive Director of the Center, Ms. Cosette Canilao, former Executive Director of the Center, Dr. Epictetus Patalinghug, Prof. Emeritus of UP College of Business Administration, Mr. Romulo Neri, former NEDA chief, and Mr. Jimbo Reverente of NAIA Consortium. Dr. Patalinghug expressed reservations on unsolicited PPP because of lack of competition, lack of transparency, and this leaves room for corruption. The original proponent can match the best offer, which may discourage further participation in the Swiss challenge. I still support unsolicited PPP for at least two reasons. One, government officials especially in DPWH, DoTr and OP are constrained by their six-years term so the solicited PPP projects they will identify will likely be aligned with their business partners before or after their term which is a long-term engagement. And two, there are too many potential projects nationwide that many investors with long-term exposure on certain provinces and regions can think of. Among the PPP projects that I think should be prioritized is the construction of long and elaborate tunnels under the mountains going up to Baguio City (via Kennon Road is 33.5 kms., via Aspiras–Palispis Highway or Marcos Highway is 47.2 kms). Then the mountainous Dalton Pass connecting Nueva Vizcaya and Ecija provinces. Buses and cars are crawling on those roads (especially in Dalton Pass) as there are many big, long and heavy trucks, sometimes tricycles, negotiating the climbs and curves. It will be a partnership between mining firms and tollway firms. The cost of construction and, hence, the future toll rates will significantly decline because mining firms will get all the rocks and minerals, metals and non-metals and, hence, will contribute big money for such extraction and tunnel boring. The advantages of these projects are (1) safety: accidents and deaths due to landslides, cars and buses falling off deep cliffs and mountains will be eradicated; (2) faster travel time: there will be no intermittent landslides blocking roads, tricycles and bicycles on the roads; and (3) huge employment generation in mining and construction. Anti-open pit mining environmentalists who love to travel across the country can support this as this is tunnel mining, not open pit, and it will quicken their travels. For mining companies, this is an opportunity for them to join big PPP infrastructure projects while retaining their core business. Many metallic products retain their high prices compared to a decade ago, like gold, silver and lead (see table). For toll road companies, this is a good exposure to the engineering skills and machineries of miners in boring deep, long distances. Meanwhile, the newly proposed mining tax bills in Congress tend to be more extortionary. TRAIN law has raised the mining excise tax from 2% to 4%, the new bills will impose variable royalties on mining margins of 1-5% for firms outside designated mineral reservations. These policies do not recognize the job creation, community development, high taxes paid, and soon toll road-tunnel development functions of mining. Government should step back from more taxation. Last Wednesday October 24, I turned 5_ yo, getting closer to dual citizenship [Filipino citizen, senior citizen :-)] few more years. I am very thankful to friends who greeted me. Including pm and greetings under others' greetings, I got around 700 cheerful notes. Thank you very much friends. Please endure my often 'politically-incorrect' positions, I just have to speak up my mind and data. Thank you. 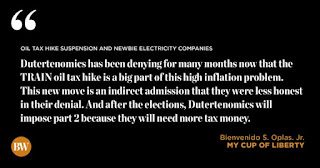 * This is my column in BusinessWorld last October 18, 2018. The government recently announced that it will suspend part 2 of the oil excise tax hike this coming January 2019. So another increase of P2/liter for both diesel and gasoline will be temporarily suspended but the tax hikes in 2018 of P2.50/liter for diesel and P2.65/liter for gasoline (from P4.35 to P7.00/liter) will remain. The reason given is that both the Senate and the Department of Finance, as well as Malacañang, believe that Dubai crude prices will exceed the $80/barrel this October to December and might reach $100/barrel in 2019. So instead of waiting for January 2019, they already announced it ahead. But the real reason not admitted by the government is that they are scared to lose votes in next year’s midterm elections because of spiraling inflation. Since they cannot have more tax money and more votes at the same time, they suspend oil tax hikes part 2. Then they can play the “we are sensitive to public sentiment against high inflation” card even if they remain insensitive to retain the oil tax hikes this year, the coal tax hike part 2 will still proceed. 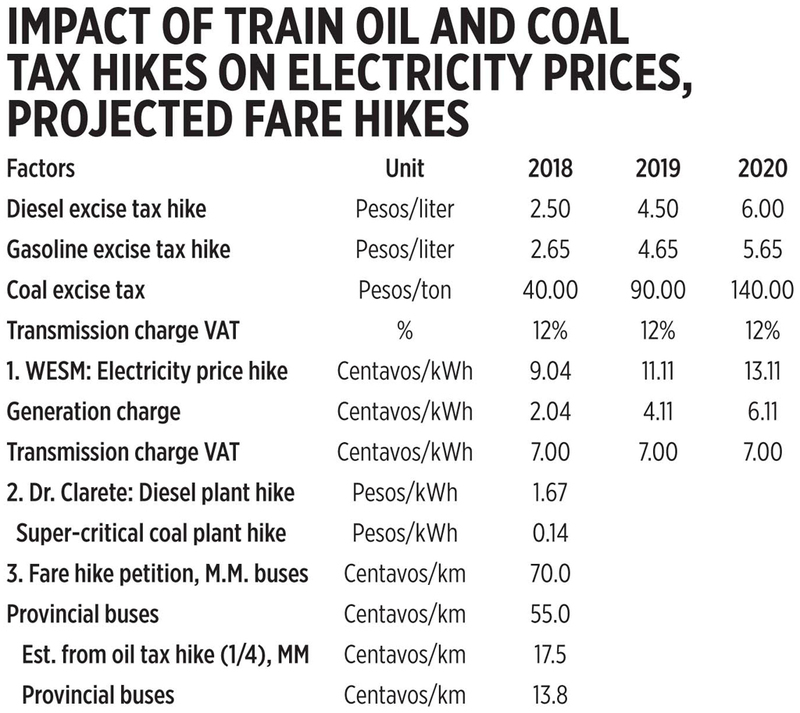 Dutertenomics has been denying for many months now that the TRAIN oil tax hike is a big part of this high inflation problem. This new move is an indirect admission that they were less honest in their denial. And after the elections, Dutertenomics will impose part 2 because they will need more tax money. Below are estimates of the impact of TRAIN oil and coal tax hikes. The first estimate on WESM prices are from Atty. Saturnino Juan, President of the Independent Electricity Market Operator of the Philippines (IEMOP), made during the Stratbase-ADRi forum on “Energy Outlook” last Sept. 27. The second estimate is from Dr. Ramon L. Clarete in his paper, “Electricity prices and TRAIN” published by EPDP last February 2018. The third estimates, on impact on fare hike petition by buses, are mine. The P0.70/km. and P0.55/km. fare hike petitions were made around July this year when domestic oil prices were only around P11-12/liter over December 2017 prices. So the oil tax hike constituted around one-fourth (1/4). Also recently in the energy sector, two newbie players sprouted out of nowhere and have become potential dominant players via legislation. The first is the Solar Para sa Bayan Corp. (SPBC) of Mr. Leandro Leviste, son of Sen. Loren Legarda, seeking a franchise to construct, install, establish, operate and maintain distributable power and minigrid systems throughout the Philippines. It is a no-or-little track-record corporation that wants to do anything they want — can connect anywhere, can build their own grid anywhere, can carve out to DUs franchise areas. And because they have a “super franchise” by legislation, they can possibly issue a sort of “mini-franchise” on other companies. Clear cronyism. It will be another anti-EPIRA corporation that can undermine the ERC’s power to regulate the competitive operation of the electricity market. The other newbie is the MORE Electric and Power Corp. (MORE Power) seeking to take over the current franchise area of Panay Electric Company (PECO) serving the big Iloilo City and other parts of Iloilo province. MORE Power was previously MORE Minerals Corp., a unit of Enrique Razon, Jr.’s Monte Oro Resources and Energy, Inc. (MORE). The Private Electric Power Operators Association (PEPOA) expressed dismay over this development. The PECO franchise bill was filed in Congress in July 2017 and after two hearings in November that year, nothing followed. In contrast, the MORE Power franchise bill was filed only in August and a second hearing was already held a month after. Business uncertainty is obviously created in Iloilo. Congress should be more transparent in its issuance of legislative franchises to minimize this uncertainty and dispel accusations of favoritism. One reader of my BWorld article on MMDA towing last December 2017, Lextanne Pantoja Tan, sent me a fb pm but since we are not friends, his pm went to the 'message request' folder, which I hardly open, usually after many months. Below is his pm, blogging this with his permission. The photo here I got from the web, not from him or from my camera. Ang masakit kasi nagdala pa po ako ng mekaniko at dahil malayo, malaki charge sakin... Ang sakin.sir, andun na ako na i tow nila ako, pero bakit ang tigas ng puso nila sa pakiusapan. Bakit kailangan nila mang gantsu o sapilitang mag tow sa ngalan ng batas ng mmda? My car is still in Marikina, may naawa po sa akin sir ginawa yung timing belt,libre, pati belt mismo, then yung tumukod na barbula po. Hulog po ng langit sa katulad kong mahirap sir. Lextanne Pantoja Tan is with Ricky Bangs and 4 others. Me: Sorry Lextanne, I just saw this as I don't regularly check 'message requests' folder. Can I blog this story of yours? thank you. I understand medyo matagal na po eto. 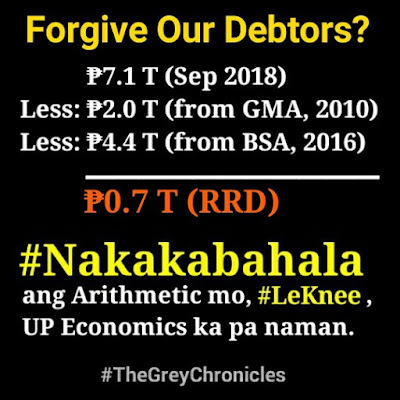 Though, i can still feel the damaged they brought to me and even in my family as it involved my financial status, sadyang masakit lang po isipin sir, na kapwa natin pinoy ang gumagawa ng kalokohan para maiangat ang mga sarili nilang pangangailangan. Madami ngyari sir, ng dahil lang dun sa pagdala nila sakin sa Marikina. Andun yung naloko ulit ako ng mekaniko, i paid for overhauling na hindi naman pala ginawa. But I know it was a great lesson for me... Thank you sir, kahit papaano napansin mo ang message ko po. I admired for what you did in your case. It was well delivered to the public. You can blog it if you want sir. And if you don't mind, pls inform me the link para ma share ko din po. 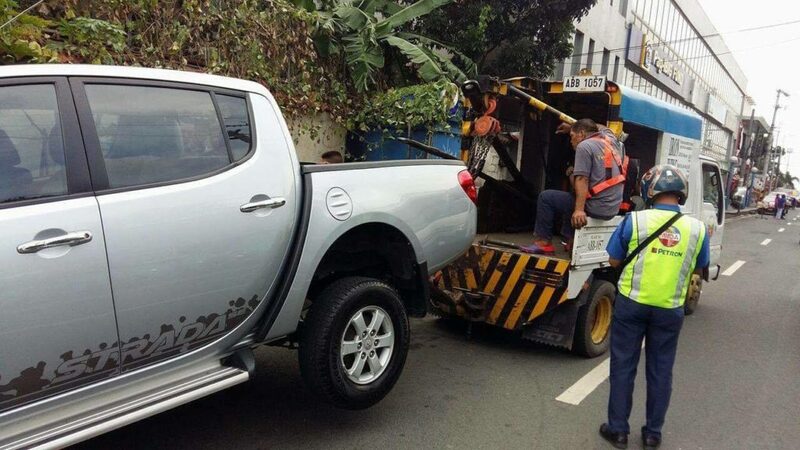 Sadyang ginagawang hanapbuhay ng mga towing company ngayon ang panghuhuli (not all) but most of them. I took these photos today of my treehouse in the farm in Bugallon, Pangasinan. It's now 14 years old. And view from the 2nd floor of my treehouse overlooking a field of gold, mature rice ready to be harvested. The farm caretaker Nong Endring and his partner-farmer planted the rice. Closer view of the treehouse. It is perched on a big, live mahogany tree. The trees around it except the front view are mostly mahogany. No electricity in the area so a bit lonely at night but very quiet except for some chirping insects, a dog barking from time to time. I don't sleep there anymore at night when I visit the farm. Other parts of the farm are planted with mature mango trees. Nong Endring said they expect small harvest here because a new pest has attacked the rice when it started producing the grains, so there are fewer mature grains now. This is among the problems of non-mono-culture, pests (including rats, maya birds, etc.) hiding or residing in nearby trees and grasses can attack the crops. Mono-culture can deprive these pests to establish elaborate hiding areas. Again, this is NOT my farm, I don't own it, Millora Enterprises own it. I just visit it regularly, the Millora family is my second family in Manila. 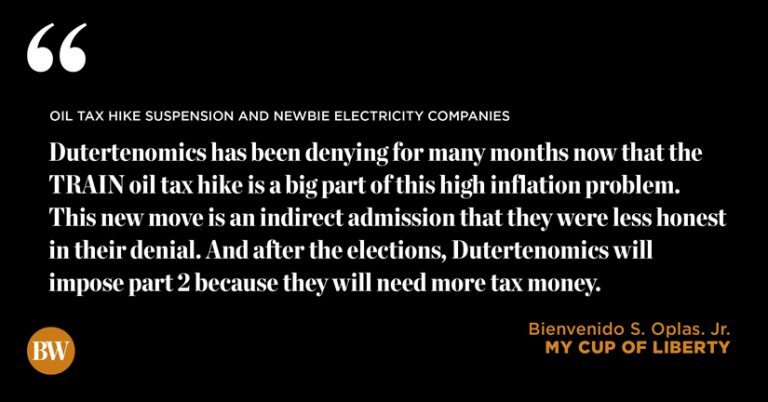 * This is my column in BusinessWorld last October 15, 2018. The Duterte economic team aka “Dutertenomists” composed of the DBCC, the Secretaries of DoF, DBM and NEDA and Governor of BSP have been peddling the “6.7% inflation rate will be the peak” statement after the September inflation was announced. They are daydreaming, of course. Not included in their calculations and projections is the granting of huge fare hikes for public land transportation any day from October to December. And this will have a big inflationary pressure in the last three months of the year. Here is a summary of various fare hike petitions that I gathered from various sources. The provincial air-con buses seem to have a minimum fare of P50 to encourage many short-distance passengers to take the non-aircon ordinary buses instead. The last fare hikes granted by the Land Transportation Franchising and Regulatory Board (LTFRB) were March 29, 2011 for Metro Manila buses and December 15, 2008 for provincial buses. Not included in these fare adjustments are under-recoveries for zero fare adjustments in 2018 nine months alone, and 12 months of 2017. The LTFRB is among the dinosaur agencies, outmoded 1960s thinking bureaucrats who still think until now that fare adjustment is a function of politics and bureaucracy, not of changing world oil prices, peso exchange rate, and supply-demand dynamics. In the transport network companies (TNCs) sector for instance, LTFRB has been engaged in two forms of command and control policies: (1) franchise control (limiting or capping the number of franchise units), (2) fare control via surge price control to 2x maximum, and abolition of P2/minute, which it later retracted. While TNCs fare control has been partially addressed, LTFRB has not lifted its franchise control, which may be construed as favoring the big taxi companies. When Uber left Southeast Asia in April 2018, Singapore-based Grab became the dominant player in the region and in the Philippines. Shortly after, many new local TNCs sprouted in the country like HirNa, GoLag, Iparra, MiCab, Mober and U-Hop. Now a new but big regional TNC player, Indonesia-based Go-Jek, wants to enter the Philippines. Most if not all local TNCs are worried when Go-Jek initiates a ‘price war’ as its entry promotion, which Grab can easily match. Is Go-Jek entry good for the Philippine economy? From the perspective of passengers and the public, the answer is Yes. This means more competition, more choices, shorter waiting time. Which means many car owners will consider leaving their cars at home and take any of the competing TNCs going to work, which can help reduce Metro Manila traffic. From the perspective of local TNCs, the answer is No. The likelihood that they will be eased out and might go bankrupt is high. Unless they will consolidate and merge with each other, pool their capital and technology resources and possibly invite foreign investors and players. From the perspective of dominant player Grab, the answer is likely Yes. This will dispel or disprove lousy accusations by the public and even by some government agencies like the PCC that they are a “virtual monopoly” and hence, must be constantly monitored if not be over-regulated and over-bureaucratized. From the perspective of government, it is a mixed challenge. To accommodate a new big player and allow existing players to adjust and expand, LTFRB must lift the 65,000 cap for TNCs franchise, either double it or abolish the cap altogether. This will diminish the bureaucrats’ power to harass both TNCs and individual car franchise applicants but at the same time, they will be praised by the public for easing the supply gap of TNCs. The nationalism card or “have more local players, reduce foreign competition” does not hold water always. The Philippines auto industry is composed of 100% multinationals — Toyota, Mitsubishi, Hyundai, Kia, BMW, GM, Ford, etc. and we are okay. The same for buses, there is not a single local auto firm. Bottom line, there should be more competition, more capitalism, and less politics and bureaucratism. 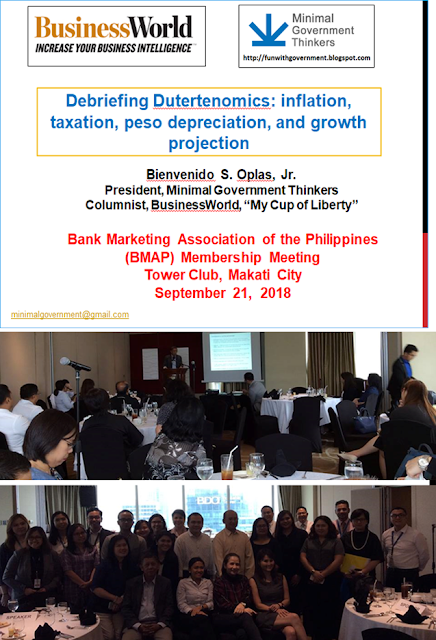 Last month, BMAP wanted a speaker from BusinessWorld for one of their monthly membership meetings. A BWorld staff they know, Mark Cunanan, gave my name. So I was the guest speaker in their meeting last September 21. My 24-slides ppt is here, https://www.slideshare.net/Noysky/debriefing-dutertenomics-inflation-train-peso-depreciation-gdp-slowdown. 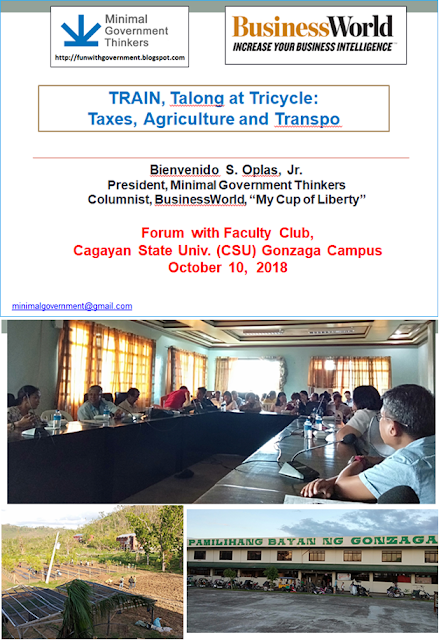 Then when I went to Gonzaga, Cagayan early this week, my friend and former classmate in UPSE-PDE, Dr. Vic Balatico who hosted me and also President of the CSU-Gonzaga faculty club or association, asked me to give a basic discourse on TRAIN and its implication on local transportation, tricycles, no taxi there, and agriculture. My 21-slides ppt is here, https://www.slideshare.net/Noysky/train-talong-at-tricycle. I forgot to post this earlier but these two screen shots were fb posts by a DILG UnderSecretary last September 07, 2018. These are words of defensive minds, perhaps bright in politics and local government but a 3rd-rate mind in economics. 1. "If the anti-inflation efforts will be put in place..."
The pro-inflation efforts of the administration were the various tax hikes under TRAIN law. High world oil prices, high US interest rates, Peso depreciation, only exacerbated the adverse impact of TRAIN law. To fight or reverse the inflationary pressure, the admin should reverse those oil tax hikes, or cut taxes somewhere that will mitigate the damage caused by those tax hikes. 2. "end the year with 4-4.5%." Far out. January-September or ytd 2018 PH inflation was already 5.0%. Assuming the 4.5% full year 2018 inflation can be attained, this means that average inflation rate for October-December should be 3.0% or less. Will not happen. 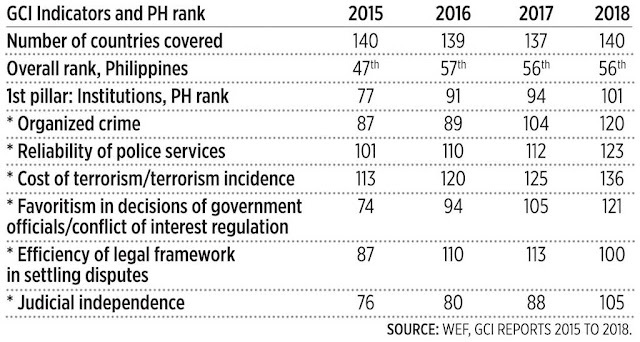 PH inflation consistently on the up trend since TRAIN law was implemented. Only 2.9% in December 2017, went up to 3.4% in January, 3.8% in February, 4.5% in March,... 6.4% in August, 6.7% in September. October inflation looks more like 7.0% or higher, not 3.0% or lower. The multiple sources are funny. PSA and/or BSP can give those numbers. Anyway, many Duterte officials and supporters use the argument, "Naka-survive nga tayo sa 50%, 23% inflation rates noong 1984-85, aangal kayo sa 6.4% inflation?" Precisely that we should not aspire or even justify the current high inflation because it is bad and anti-consumers. Besides, we have already experienced a 1.4% inflation rate in 2015 (based on CPI=2006, if CPI = 2012, inflation that year was only 0.7%), why is 4.5% or 5% justifiable? 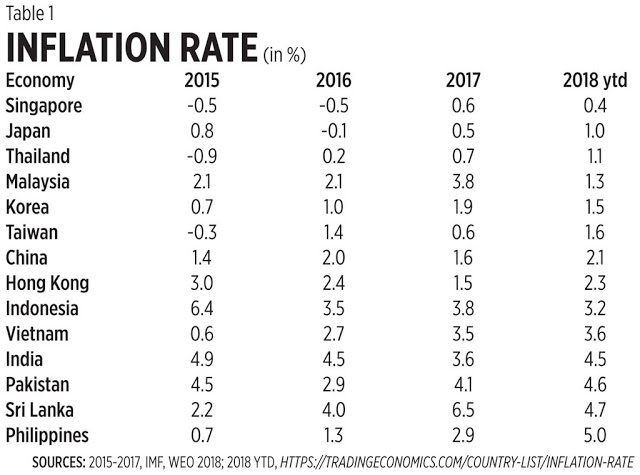 Finally, despite the rise in world oil prices, rise in US interest rates, many Asian economies have experienced lower inflation in 2018 ytd than in 2017. The Duterte administration is enjoying and frolicking with more money taken from the pockets of the citizens via TRAIN law, on top of existing multiple taxes. Hence, the dishonesty to admit the damage created by that law in the current high inflation problem. * This is my article in BusinessWorld last Thursday, October 11, 2018. This is corruption and distortion of earth science. 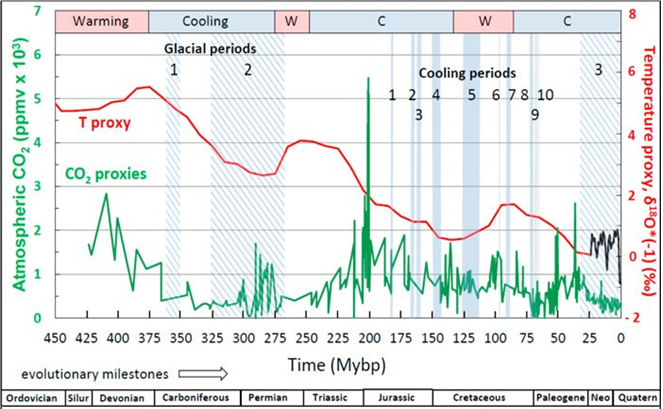 Earth’s climate history is one of natural warming-cooling cycles since the planet was born some 4.6 billion years ago. In a paper by Davis, W.J. (2017), “The relationship between atmospheric carbon dioxide concentration and global temperature for the last 425 million years,” Climate 5: 76; doi: 10.3390/cli5040076, this chart shows that atmospheric CO2 levels were up to 400 to 600 ppm some 325 to 450 million years ago and it was characterized by global cooling. This is pure alarmism and Frankensteinism, inventing own data to scare the public unless they accept the renewables cronyism agenda. Planet Earth is currently experiencing declining temperature in the lower troposphere, data are collected by NASA satellites 24/7. Game, if wind-solar are indeed that cheap, then will the lobby agree to (a) abolish the priority and mandatory dispatch of wind-solar to the grid, and (b) abolish the feed-in-tariff (FIT) scheme of guaranteed high price for wind-solar, other variable REs for 20 years? Solar price of P9/kWh at P54/US$ is not 2.9 cents but 17 cents/kWh. Wind price of P8.5/kWh at P54/$ is not 4.1 cents but 16 cents/kWh. The FIT-Allowance in our monthly electricity bill has been rising from 4 centavos/kWh in 2015 to 12.40 in 2016, 18.30 in 2017, and 25.32 centavos /kWh starting June 2018 billing. This is to cover under-recoveries in 2017 alone. Ignorance of the private event. That Stratbase-ADRi forum last Sept. 27 has four speakers, Sen. Sherwin Gatchalian, Dir. Mario Marasigan of DOE, Dr. Raul Fabella of EPDP and UPSE, and Atty. Saturnino Juan of IEMOP. I was not a speaker, I was only one of three reactors, and about one-fifth of the audience were media people. Sure. One projector each, charts vs charts, tables vs tables, with an independent referee who will cut off over-talking and hysterical speaker/s. Let the jokers and inventors of fake energy data be exposed. A European wind-solar developer and lobbyist responded to my column, Cheap, stable electricity vs climate alarmism last September 24, 2018. The letter was published in BWorld last October 10. Reposting it below. AS ONE of the climate alarmists Bienvenido S. Oplas, Jr. refers to in his opinion piece of September 23 (“Cheap, stable electricity vs climate alarmism”), I welcome the debate he has opened. Opinions are one thing, facts are another. Our species emerged over 3 million years when there was a stable quantity of CO2 in the atmosphere, and this was the figure up until industrialization: 270 parts per million. Now it is 405 and rising rapidly. This means that we are capturing more energy in the atmosphere than we used to. How much, I hear your readers ask? We are capturing the energy equivalent of 4 Hiroshima atomic bombs each second. In fact since 1998 we have trapped the energy of 2,667,000,000 Hiroshima bombs in the atmosphere. Cause for alarm? I think so. 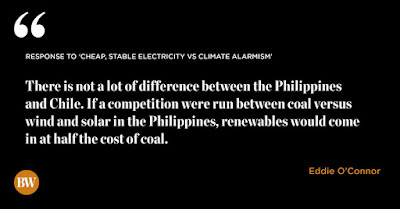 I notice that Mr. Oplas didn’t talk about the price of coal-generated electricity. The US Agency, the CIA which studies these things, estimates that the cost of electricity coming from coal-fired generation over the life of the power station is $9.2 cents per unit. 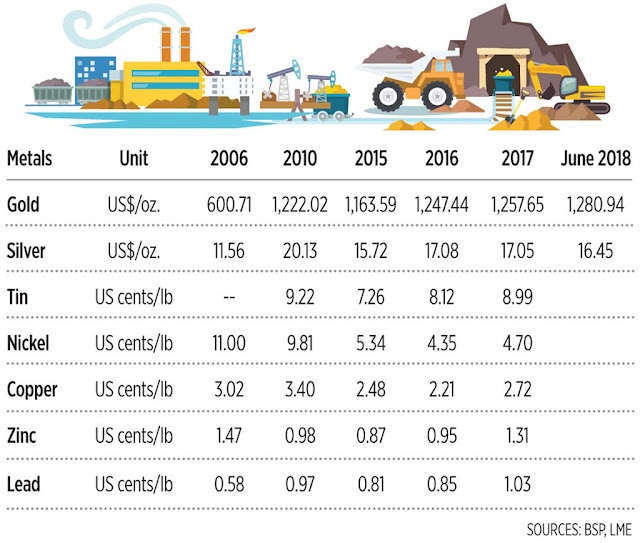 This figure was confirmed for me, as the cost of new coal generated electricity in the Philippines. This figure includes no clean-up charge. In bidding for generation in Chile during 2016, where there is no subsidization of renewable energy, my company bid $4.1 cents per unit of electricity for 20 years. This was for firm power, which means my company had to supply the equivalent of what coal or gas supplies. No variability, no intermittency, pure clean power that releases no CO2. We will generate firm power from renewable energy at $4.1 cent per unit of electricity, which is less than half the price of coal-fired generation. Solar came in at a price of $2.92 cents per unit. Even old coal plants, which had its capital cost paid off, could not compete against new wind and solar. They won no contracts. There is not a lot of difference between the Philippines and Chile. 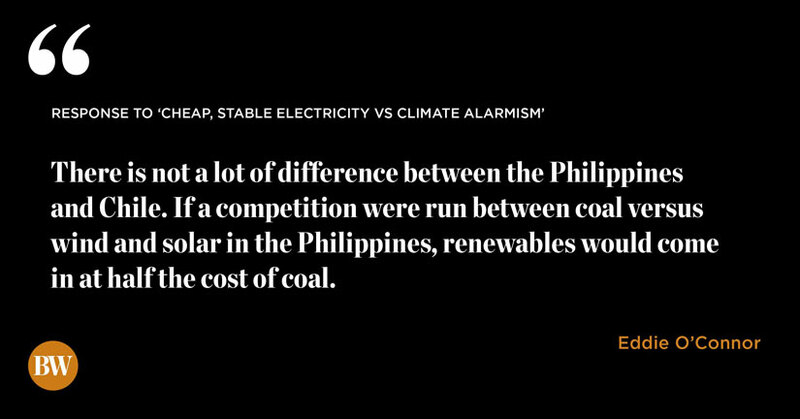 If a competition were run between coal versus wind and solar in the Philippines, renewables would come in at half the cost of coal. I notice that Mr. Oplas is associating himself with an invite-only conference where there will be no challenge to his views. The only way to get to the truth is to issue the following challenge to Mr. Oplas: Let us choose a public auditorium and let us have a debate on energy policy in the Philippines. I guarantee the putative audience that I can prove that renewables are great for the Philippines. Great for firm power, great for price, and great for the environment. I will even pay for the venue. I would love to see the Philippines cut the price of electricity in half, just as Chile has done, by adopting a competitive system for selecting the next tranche of generation. Eddie O’Connor is Executive Chairman and Founder of global wind and solar development company Mainstream Renewable Power. Last Sunday October 07, I travelled Manila to Bugallon, Pangasinan, 200 kms. I transferred some personal stuff to my little hut in Bugallon. Then Monday October 08, I took this 620+ kms trip. 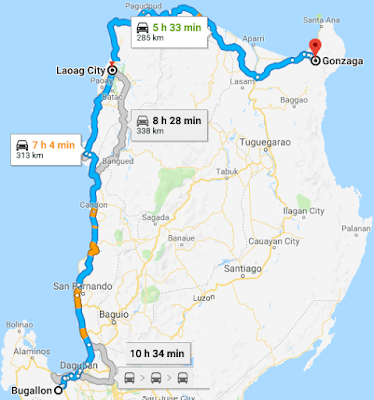 Left Bugallon, Pangasinan around 6:30am Monday, arrived Gonzaga, Cagayan 2am Tuesday. Multiple rides, 5 bus rides, 19 hours. Tiring but good sights of northern Luzon. 1. Bugallon to Dagupan, I forgot the name of the bus, ordinary, no air-con bus Mangatarem-Dagupan. 2. Dagupan-Pozorubio, Victory bus, ordinary. I made a mistake in taking this bus, I was in a hurry and did not check properly the signboard and just boarded the departing bus. I should have taken the bus to Agoo. 3. Pozorubio to Vigan, Partas (first bus that came), air-con but no CR. 4. Vigan to Laoag, Viron bus, air-con but no CR. Slow bus. 5. Laoag to Gonzaga, Florida bus, air-con with CR. Left Laoag 8+pm. I went to Gonzaga to visit a good friend, Dr. Florante Vic Balatico, professor at Cagayan State Univ. (CSU) Gonzaga campus. His only child is my godson. Two nights of drinks with exotic pulutan that Vic and wife Au prepared. Blue marlin sashimi, crabs, shrimps, eel, other fishes, vegetables, awww. No chicken or pork, big change from my regular food in Manila. We did not go to Sta Ana anymore, I've been there before, have photos with Coast guard and Navy men there, about 15 years ago. I also gave a lecture on TRAIN law, inflation, etc. at CSU Gonzaga campus' faculty and non-academic staff last October 10. Last Thursday, October 11, I took this 615 kms. trip, left Gonzaga, Cagayan 8am Thursday, arrived Cubao/Manila 1:30am Friday. 1. Gonzaga to Tuguegarao, aircon van or UV Express. 2. Tuguegarao to Cubao/Manila, 5 Star aircon bus with CR. I also strolled briefly around the newly-opened Robinson's Mall Tuguegarao, nice place, lunch. First and foremost, too many motorcycles and tricycles now in the highway except tollways. The poor no longer ride cows or bicycles. The poor also use cell phones and FB, email to communicate, not slow mails or smoke signals. GDP growth is real and broad-base. But these slow tricycles drive in the inner lane instead of the outer lane, they can cause vehicle congestion if the roads are going up, or in curves. Second, many provincial buses now have CR, deluxe bus and fare difference with regular aircon bus is small. One can drink beer or lots of water inside and not worry about the next bus stop with CR. Third, very few mini bus or jeepney in between provincial cities. Aircon vans or UV express are now the dominant transpo services. So if the poor don't ride motorcycles to travel 30, 100 kms, they ride aircon vans, the fare is not big because of competition among many vans. Gonzaga to Tuguegarao is 133 kms and fare is only P200. But the vans travel fast, a bit uncomfortable at first if one is used to driving slow like me. Then they stop in some areas to wait for passengers then drive fast again. Four, lots of palay or corn drying on the highway. It's good that many national and provincial roads are now 4-lanes, sometimes 6-lanes. Scam on UN-Federal government "grant"